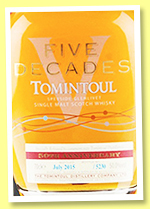 We all know that Tomintoul ages very gracefully, but while you could still find some early distillates (1966 – 1969) around five or ten years ago, they’re now becoming very rare. Or sometimes a tad too fragile. Anyway, today’s key number is ‘50’! This baby’s a blend of whiskies from 1965, 1975, 1985, 1995 and 2005, so while pretty old on average, it’s technically a ten years old (or maybe even nine). It was composed to celebrate the distillery’s 50th anniversary. Colour: gold. Nose: a little mindboggling, because you can feel both the old Tomintouls (overripe apples, herbal teas and a light tropicalness) and a more ‘modern’ side, with vanilla, coconut and some sweet/herbal oaky tones. Quite some cedar wood is getting everything together. With water: notes of lager and ale, with some vanilla and overripe fruits. Mouth (neat): it’s not that all these decades diverge or collide, but once again, there’s this wee feeling of a whisky doing the splits, although the end result remains very good. Some sour apples and quite some oak, ginger, hints of green bananas (which many old Tomintouls were already having…) With water: the younger ones win it. Barley, oranges, vanilla custard… Finish: medium, with these notes of sweet ale again, while the bananas are back in the aftertaste. Comments: very solid. Would love to know about the proportions, having said that. Sadly the last bottling ever composed by maestro Silvano Samaroli himself, a project that, most regrettably, he couldn’t complete in his lifetime and which his dear and lovely wife Maryse just made happen. Bravo, Maryse! Colour: gold. Nose: some could have become a little tea-ish and slightly over-oaky, but that’s not the case at all here, it’s still very fresh and very vibrant. A wonderful fruit salad, with the usual apples and bananas, but also mangos, papayas, and a hoppy touch (more IPA than lager, mind you). Some praline then, and a growing cigary side. Or rather proper Virginia cigarettes. Totally lovely and rather delicate. Mouth: there is a little oak but it’s of the greater kind, rather on the camphory side if you will. Some soft mint cordial, touches of myrtle liqueur, then our friendly green bananas, various apples and even pears, oranges, and this light yet deep tobacco-y side. Then a little cedar wood, cinnamon, and Darjeeling tea. Strength and body are both perfect. Finish: this is where a 50-yo whisky should feel over-oaked, but once again, balance has been preserved and the fruits are still singing. More Darjeeling in the aftertaste, earl grey... Comments: it’s not even a little fragile, mind you. Pace, here’s to you Silvano (and Maryse).